Whether your home is traditional, classic, eclectic or contemporary, Adelé in Chevy Chase has the perfect designer wall coverings for the feeling you’re after. Adelé has hundreds of beautiful, classically inspired designer wall covering patterns. From practical to practically exquisite, Adelé carries all the looks that are putting designer wall coverings back in the forefront of interior design. Wall coverings have gained in popularity over the last few years. Wall coverings add personality and style without being overpowering. Social media has played a big part in the comeback of wall coverings. Designers are posting their projects on Pinterest, Houzz and Instagram, making consumers less hesitant to use wall coverings. Your home is an extension of who you are. Your personality. Your interests. Your style. No one knows this better than Adelé. We make it our business to understand the varying tastes of our customers, keeping up with the evolving trends in the industry and providing the highest quality designer wall coverings for your home. Regardless of your interior decorating style, Adelé offers everything you need to transform your creative ideas into reality. Wall coverings set the tone of a room through colors, textures and patterns. From classic styles to contemporary patterns, from soft neutrals to bold and bright colors, wall coverings make a statement. 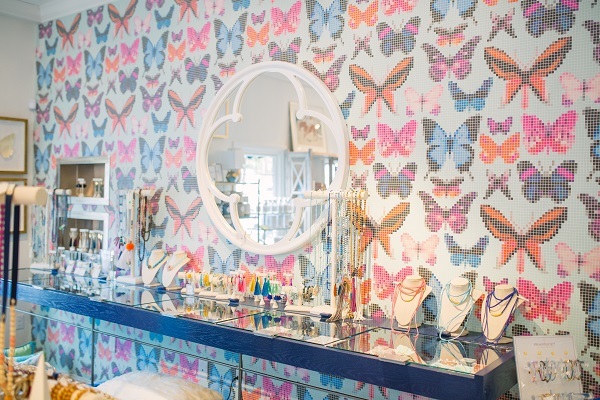 Wallpaper allows the expression of individual style and adds instant character, color and dimension to any room. Adelé offers the greatest selection of designer wall covering designs to perfectly frame your space. Choosing the right wall covering can be a driving factor in setting the mood for a specific room or rooms. Adelé specializes in helping our customers choose wall coverings that not only reflect their personal style but also compliment or enhance their overall design. Our always changing wall coverings feature today’s designer wallpaper, vinyls, grasscloths, silk string, textures, mylars, florals and much more. At Adelé, we can provide countless beautiful and unique designer wall covering ideas for your kitchen, bathroom, living room, bedroom or office space. We carry designer wall coverings from contemporary to traditional with an extensive variety of patterns, colors and textures. Let Adelé put our decorating talent and expertise to work for you. We also provide expert installation. Our superior customer service at Adelé means that we will be there for you long after the sale. We believe that high quality goes hand-in-hand with amazing style. Our mission at Adelé is to provide the best values on the market. Our customers return to us because we offer excellent products and unparalleled service. We treat every job with the utmost care. Beautiful designer wall coverings from Adelé truly transform the look and feel of your home. When it comes to the highest quality designer wall coverings in Lexington, Kentucky, Adelé will assist you in fulfilling your vision. We listen to your wants and needs, offer professional advice and service and we provide the quality and value for which you are looking.